Legends Of Tomorrow ran out of money this week. Superhero shows are expensive (Supergirl is currently going through budget woes that are impacting its future), and when a series is operating on a grand scale like this one, sacrifices need to be made in order to get those big moments of spectacle viewers expect. Those sacrifices are made in “River In Time,” which has none of the show’s strengths—big action sequences, fun period designs—and all of its weaknesses, namely a focus on Vandal Savage, Kendra and Carter, and nonsensical time travel mechanics. The majority of the episode takes place on the Waverider as Rip and his team navigate their way to the Vanishing Point, home base of the Time Masters, with Vandal Savage in tow, and the heroes start to act really stupid once they have their greatest enemy on board. Sara and Ray allow themselves to be easily manipulated by Savage when they visit his cell, which is especially shameful because Vandal Savage is so obvious about his manipulation. That’s a problem with Casper Crump’s performance, but it carries over to Savage’s performance as a prisoner, which is so exaggerated that it makes Sara and Ray look idiotic for accepting anything he says. Ray and Kendra’s plot hits the same goddamn beats it’s been hitting for six episodes, except now Carter is actually a physical presence getting between them instead of a memory. Ray is jealous of Carter, Kendra is in denial about her feelings for Carter, and Savage’s meddling makes their emotions more intense. This tedious plot finally comes to an end when Ray breaks things off with Kendra (on a positive note because she taught him to love again), but I doubt things are going to get better for Kendra now that Carter is back in the picture. Carter regains his memories at the most convenient moment in their battle against the escaped Savage, but this moment of victory is diminished by the fact that Carter’s character has been painfully uninteresting in his few appearances on the series thus far. 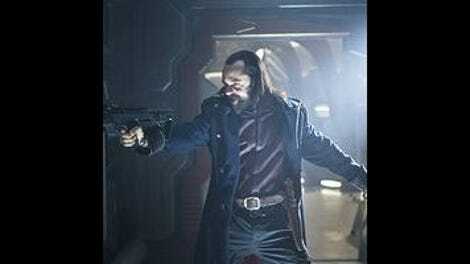 Writers Cortney Norris and Anderson Mackenzie pad out ”River Of Time” with unnecessary flashbacks to what certain characters did before they joined Rip on his mission, which also allows the writers to add some new locations to the story by using the sets they already have from Arrow and The Flash. These scenes do very little to enlighten the main action, and while its fun to see characters like Felicity and Nyssa make quick cameos, their appearances feel totally random in the narrative. The person with the most meaningful flashback is Jax, and even though the script gets pretty heavy-handed with his mother giving him a watch intended for his father, the scene provides valuable context for later events in the episode. Martin is the only person that realizes Vandal is trying to plant seeds of discord within the group, but Martin has his own problems this week, once again robbing Jax of his right to choose and thinking himself a hero for it. Jax finds himself in fatal danger when he’s exposed to temporal radiation while repairing the Waverider, and Martin believes that the only way to stop the rapid aging of Jax’s body is to send him back to 2016, which will repair the damage because of science or something. Jax doesn’t want to go along with this plan, so Martin injects him with a sedative again and sends him back against his will. Sure, this might be the only way to save Jax’s life, but good god, Martin, let the man make his own decisions instead of repeatedly hijacking his life. The only reason Jax is even in this mess is because Martin roofied him and sent him back in time against his will, so maybe he should just step back because he has a tendency to make things way worse. Why don’t Martin and Jax merge into Firestorm and see if that has any effect on the radiation? It’s dangerous for them to merge while on the Waverider, but they could probably try it quickly in the loading deck and see if it does anything. It’s certainly a major option that is never even brought up, and I suspect that the absence of Firestorm is a result of this episode having a tight budget. I also suspect that’s why Ray doesn’t shrink down when he’s fighting Savage in the A.T.O.M. suit, even though that would offer him a distinct tactical advantage. These characters have abilities that would be helpful in this episode, but they’re not allowed to access them because of the limitations of the medium, which is something comic-book superheroes don’t have to worry about. 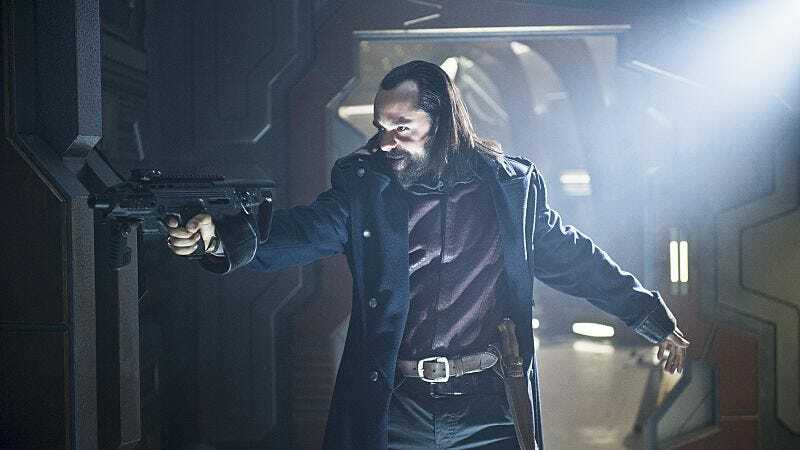 “River Of Time” ends with Rip bringing Vandal Savage to the Time Masters and discovering that they’ve been working together the whole time, which is a completely unsurprising twist considering the Time Masters have been trying to get Rip to stop hunting Savage for the entire series. The team finally has the opportunity to kill Savage in the time between Carter regaining his memory and them arriving at the Vanishing Point, but for some strange reason Rip decides to put his trust in the Time Masters rather than finish the mission he set out to do at the beginnings. This is an episode full of puzzling decisions, and hopefully the heroes’ stay in the Time Masters’ prison will give them time to mentally regroup and start thinking more clearly because otherwise the world is doomed. Mick and Snart are the best parts of this episode. Mick because he’s the only person that says they should leave Carter a brainless drone because he gets reincarnated anyway, and Snart because he knows from the get-go that bringing Savage on board is going to turn into a shitshow. Rip Hunter should take off his duster more often because Arthur Darvill has a cute bum. This episode is very guilty of using big operatic music to heighten stakes that aren’t fully realized in the script. “You roofied me again?” You have the right to be as mad as you want, Jax.